Peter Doyle (June 3, 1843 - April 19, 1907) may be the most likely candidate for the love of Walt Whitman's life. Doyle was a bus conductor whom Whitman met around 1866, and the two were inseparable for several years. Interviewed in 1895, Doyle said: "We were familiar at once—I put my hand on his knee—we understood. He did not get out at the end of the trip—in fact went all the way back with me." In his notebooks, Whitman disguised Doyle's initials using the code "16.4" (P.D. being the 16th and 4th letters of the alphabet). 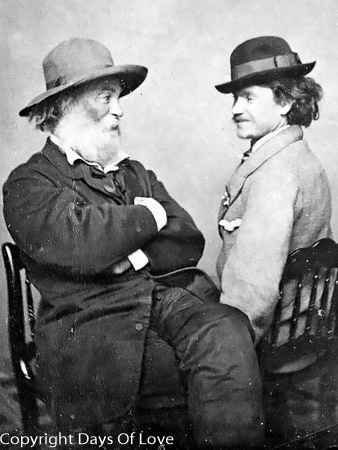 Oscar Wilde met Whitman in America in 1882 and told the homosexual-rights activist George Cecil Ives that Whitman's sexual orientation was beyond question —"I have the kiss of Walt Whitman still on my lips." The only explicit description of Whitman's sexual activities is secondhand. In 1924, Edward Carpenter told Gavin Arthur of a sexual encounter in his youth with Whitman, the details of which Arthur recorded in his journal. Late in his life, when Whitman was asked outright whether his "Calamus" poems were homosexual, he chose not to respond. The manuscript of his love poem "Once I Pass'd Through A Populous City", written when Whitman was 29, indicates it was originally about a man.